Another rocker has reacted to Voice judge Adam Levine’s recent comments on the state of rock music. Last week, Voice judge and Maroon 5 frontman Adam Levine sounded off on the state of rock music, commenting that ‘rock music is nowhere’ and that hip hop is “better than everything else”. Naturally, this drew criticism from the rock community, with Slipknot frontman Corey Taylor angrily leading the charge and suggesting Levine “go back to the f—— Voice”. Now, rock’s elder statesmen are weighing in. Twisted Sister frontman Dee Snider tried to appeal to Levine’s inner rock fan and early days jamming “I Wanna Rock,” but called the 39-year-old singer “out of touch” for his views on the current state of rock music. But it was former Skid Row singer Sebastian Bach that had the last word. 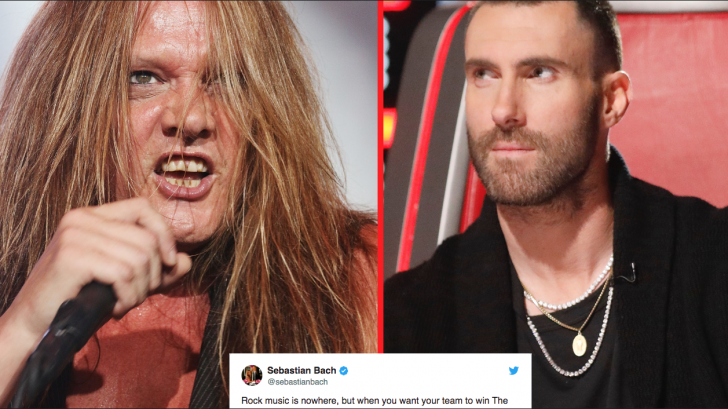 Sure, Sebastian could have gone the nasty route and really let Adam Levine have it – but there’s so much more power in his quiet reminder of rock’s roots and who’s really responsible for rock music’s past, present, and future. Rock music is still here, it’s not going anywhere, and the same songs that those reality show contestants sing night after night are the same ones inspiring the bands of today to get out there and keep the tradition going.